How the mighty have fallen. Jim Brown was a titan amongst the gods of football. It has been a long time since he left St. Simons Island, Georgia from the secure love and support of his grandmother to the harsh reality of racism in Manhasset, New York on Long Island. A long time since the sophomore who at Syracuse University stepped on to the field in 1954 and separated himself as a man amongst boys. It has been a very long time since he had one of the most dominant seasons in college football history only to finish fifth in Heisman Trophy votes and he was labeled by the media as the angry black man. It seems like an episode of The Twilight Zone. To see the same man that helped to bring athletes like Bill Russell, Kareem Abdul Jabar at the time who was known as Lew Alcinder, and many of the premiere black athletes together to fight racism. Over the past 30 years, we haven’t heard much from Jim Brown outside of media coverage of court cases and failed marriages, which is why it’s odd that he has chosen to spend so much time with Donald J. Trump. So much of the coverage of Kanye West’s rant in the Oval office has focused on him and Trump that unless you paid attention, you might not have noticed the presence of the icon that was once number 44. There are old press clippings, photos and videos of Jim Brown defiantly speaking out against the racism he endured in upstate New York and throughout his travel games in the South and Midwest. Jim knew what it was like to have his number 44 spit on. He credited the rage and defiance he held inside him as the fuel that flamed the fires that carried him to be both the NFL Hall of Fame and the Lacrosse Hall of Fame. 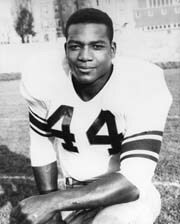 Growing up, Jim Brown was a hero of mine. I have had the pleasure of meeting him twice. This is why it comes as a shock to me that Jim Brown forgot what it meant to be number 44. In the 1950’s upstate NY was filled with sundown towns which were places that black people knew they would get lynched after dark. The KKK membership was higher in Upstate NY than most places in the south. Jim Brown had to endure constant criticism and the racism was tangible daily. When we look at his words and actions it is very obvious that Jim Brown knew the effects of racism. The question remains when did it change? In his mind when did the struggle end? Jim has spoken out against kneeling. He has embraced Trump after his treatment of the Central Park 5, and countless racist scandals. I wonder what a young number 44 would say about himself? People are dying and rather than be the strong voice we relied on in the 50’s, 60’s and 70’s we now have this bad parody of the man we once admired. I believe that those who do not speak out against my oppression have no right to tell me how to protest. Can money and fame truly make a man that has endured violent racism forget who he is and where he comes from? It appears to be playing out before our eyes and I can only hope that one day Jim will wake up and look at his number 44. We need you back in the game. Remember we are all in this together. Our collective rise is the demise of injustice. Posted in POLITICAL NEWS, WORLD NEWS Tags: Football Legend Jim Brown Forgot About Number 44 & Joined The Trump Circus!